Recently, Instructional Designers Nina Crutchfield and Sky V. King braved tropical storm weather to participate in University of Central Florida’s Instructional Design & Technology (ID&T) Open House. The Open House is an annual event inviting future students, current students and recent graduates the chance to learn about instructional design as a career, as well as discovering potential internship and job opportunities. In addition to FIU Online, employers from General Dynamics, Hilton Grand Vacations, Jet Blue, the Naval Air Warfare Training Center and others were in attendance. Nina shared her experience, “The UCF Open House was a wonderful opportunity to not only present FIU Online as an exciting workplace and leader in the e-Learning field, but more importantly to meet the bright, young minds entering the field from UCF’s intensive ID&T graduate program. 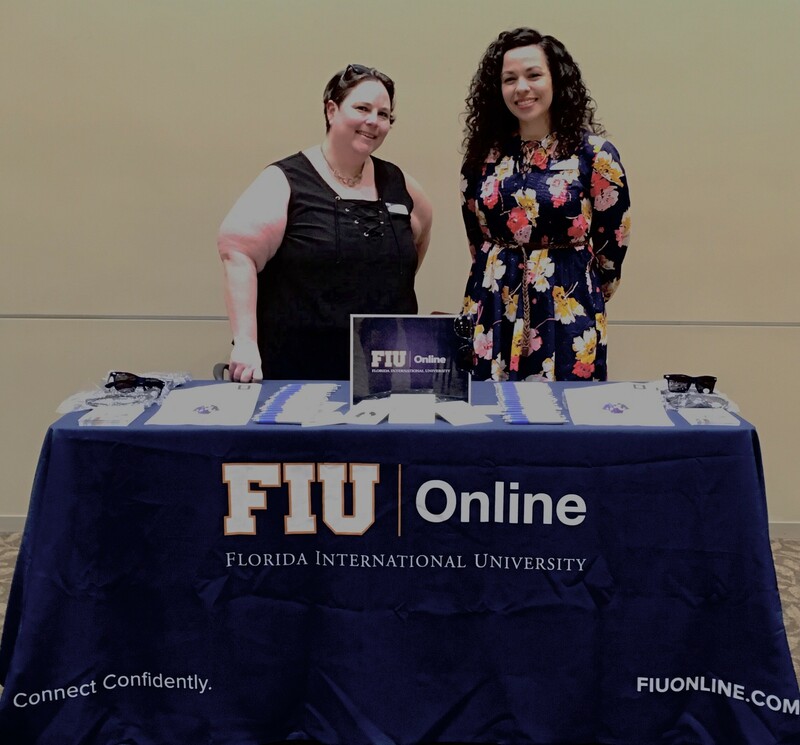 Throughout the event, both Nina and Sky met with several recent graduates to discuss why FIU Online is THE place to work. Reflecting on FIU Online’s 20 years of experience in providing online programs, a few other staff contributed what drives their passion for working with FIU Online. Stephanie Delgado appreciates the “support for her professional and personal development.” Stephanie is a Senior Instructional Designer working with the School of Education. She is earning a doctoral degree in Curriculum and Instruction with a focus on Social Justice education. In addition, she is an Adjunct Instructor at FIU and Miami-Dade College. FIU Online gives employees agency in selecting development opportunities, while providing the resources to learn and share with their colleagues. 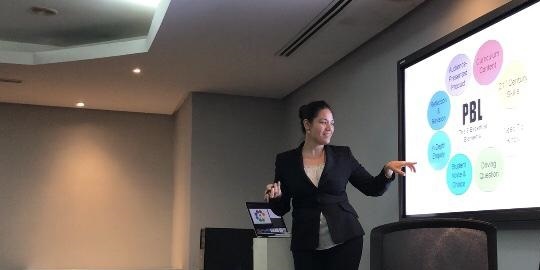 Recently in one of those development activities, Stephanie presented “Culture, Identity, and Reciprocity: Training teachers to be students” at the Caribbean Studies Association annual conference in Havana, Cuba. Many other staff represent FIU Online at conferences each year, to include the annual conference for FIU faculty and InnovedCon– Miami’s premiere conference for instructional designers and learning professionals. FIU Online helps students achieve success in another way by encouraging faculty to adopt open education resources or low-cost textbooks through its Affordability Counts initiative. This has a positive effect on student savings, course retention and on-time graduation rates which gives everyone “warm fuzzies.” Beyond providing high quality engaging courses to FIU students and life long learners, FIU Online gives back to its community through days of service by volunteering in the local community. Additionally in Spring 2018, FIU recognized the FIU Online Instructional Design team for their Service Excellence Award nomination- it’s noted that we do good things that make a difference! Dianne Roque shared that “the people” are her favorite part of working at FIU Online. Dianne should know; she’s part of FIU Online’s Human Resources staff. She stated, “We have smart and creative individuals with a diversity of skills and knowledge. It’s one thing to have amazing talent but attitude makes the difference. We come together, learning from each other regardless of our roles and collaborate to accomplish common goals.” FIU Online values that no one alone has all the answers and we are better together. If your goal is to be part of a great place to work and if the ideas of creativity, innovation and providing excellent service excite you, then check out FIU Online. Open positions are posted within FIU’s Careers page (filter by “FIU Online Web Based Courses” department). To learn more about what we do, connect with us online (and wish us a Happy Birthday; we just turned 20)! I wnt to tell you that I’m using your site for some time and you write very good info.